・What is the Hostel JIN? 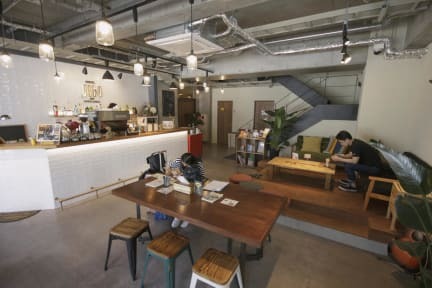 Hostel JIN is the place that be consisted traditional Japanese styles and modern western ones, and you will realize that your images for hostels have changed. Also, this hostel is for not only for tourists from any counties but for special resting time and warm communities. We have many kinds of types of rooms, such as dormitories which groups can stay together, Japanese style: “tatami” rooms, mixed with those things, and private rooms. For the dormitory rooms, you have private curtains, mini lockers, plugs for battery, reading lights, and hangers. This is very good conditions for backpackers. All rooms have wash basins, and sharing bathrooms are divided into men and women. The lounge includes a café and a bar, and you can bring anything you eat. You can enjoy its atmosphere created by the guests, local people, and nice staffs from the beginning of a day to the end of the day. 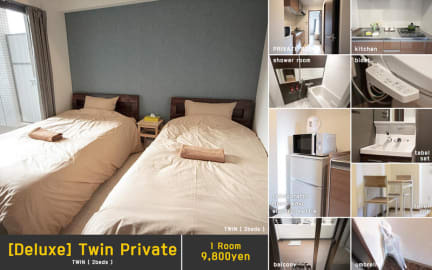 In addition, Hostel JIN is located on the place which takes 15 minutes to get to the Universal Studio Japan by bicycles, 5 minutes by trains, and any generations would be satisfied with reasonable costs. We have free Wi-Fi anywhere in the building. ＊Please contact us about your canceling from 9:00 a.m. to 11:00 p.m.